Search.wolfnknite.com is the PUP that uses misleading techniques to prevent removal. Use Reimage to locate malicious components and get rid of them faster than with uninstall instructions. A full system scan blocks virus reappearance and prevents traffic to malicious domains. How does the PUP hijack computers? 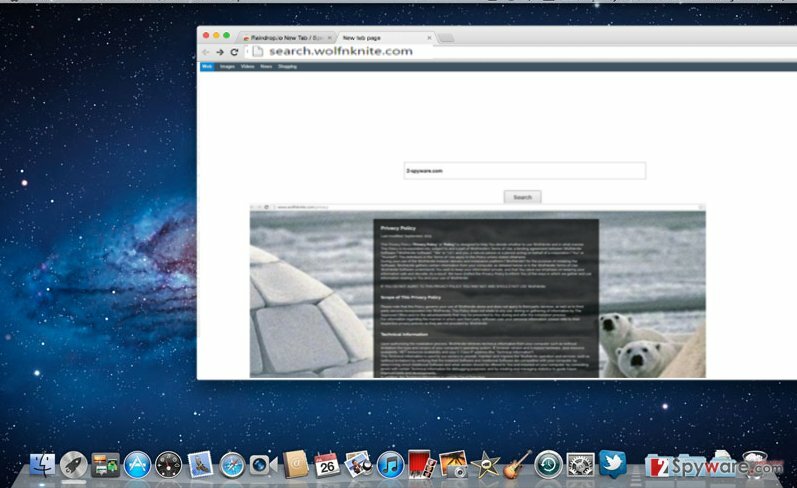 While searching for a new search engine, Mac OS users might have run into search.wolfnknite.com virus. However, we would like you to warn not to set this hijacker as the main search engine because this browsing tool has been categorized as a browser hijacker. It is programmed for the sole mission to infect a browser, replace a homepage and direct you to the specific domains. Search.wolfnknite.com redirect might turn especially annoying when you are in a rush finding a necessary piece of information. Consequently, you might blow a fuse. To avoid that, remove search.wolfnknite.com. Speaking of this hijacker, Windows OS users might sigh with relief because this PUP mainly attacks Mac operating systems. However, the cause of such preference remains unknown. The way this hijacker works does not differ. Once it manages to take control of the browser, it applies its filters and scripts. As a result, only specific search results will be provided in comparison with the objective ones shown by an ordinary search engine. Moreover, this hijacker is supported by third-parties. Likewise, the owners expect you to see more content from their partners. However, such intention comes by force. Your browser might be overcrowded with advertisements and commercial offers. We would like to warn you not to purchase anything from the affiliated websites, especially software. It is often the case that the programs, promoted by a hijacker’s sponsors, happen to be useless and sometimes even malicious. Therefore, they might also create more system vulnerabilities. Another highly annoying aspect of this hijacker is that it collects your non-personal information. The majority of legitimate websites also gather such information, however, Wolfnknite Web Search might transfer this data to its partners. After processing it, online advertising companies are able to create catchy personalized ads. They do not possess any value but only generate revenue for their owners since they are created as pay-per-view advertisements. In short, they receive income, while you end up irritated sitting in front of your computer which is overfilled with pop-ups. If this scenario does not seem attractive, perform search.wolfnknite.com removal. Reimage will ensure that no traces of this hijacker remain. It does so quite easily with the help of “bundling” technique. In other words, hackers pin down their products to freeware, for example, Flash Players, Adobe Readers or audio converters. These attachments happen to hide under “Basic” settings. 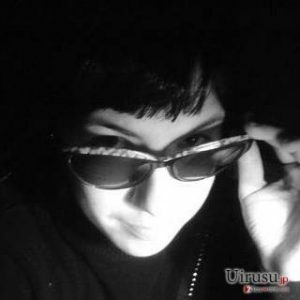 Furthermore, few users carefully go through installation wizards and spot unwanted programs. Unfortunately, the majority fails to do that. If you are interested how you can prevent the hijack of search.wolfnknite.com, remember these tips. First of all, select “Custom” mode. Only when you are no unnecessary add-ons will be installed, start installing the primary software. Luckily, the elimination of this hijacker does not require any specific or complex preparations. You can do it manually or use malware removal application. The latter might be a more efficient solution since the program is created in a way to locate any files of suspicious and potentially malicious origin. Moreover, it is the trustful guardian of your operating system. You might also successfully remove search.wolfnknite.com with the help of the manual guide. Feel free to use the one provided below. Lastly, do not forget that your cautiousness plays a significant role in the entire protection of your computer. If you accidentally installed this browser hijacker, remove it at once. Wait until you see Applications folder and look for Search.wolfnknite.com or any other suspicious programs on it. Now right click on every of such entries and select Move to Trash. Here, select Extensions and look for Search.wolfnknite.com or other suspicious entries. Click on the Uninstall button to get rid each of them. Here, look at the Homepage field. If it was altered by Search.wolfnknite.com, remove unwanted link and enter the one that you want to use for your searches. Remember to include the "http://" before typing in the address of the page. Now you will see a detailed dialog window filled with reset options. All of those options are usually checked, but you can specify which of them you want to reset. Click the Reset button to complete Search.wolfnknite.com removal process. This entry was posted on 2016-07-21 at 06:40 and is filed under Stealing programs, Viruses. You can quickly scan the QR code with your mobile device and have Search.wolfnknite.com virus manual removal instructions right in your pocket. How did you remove Search.wolfnknite.com virus?